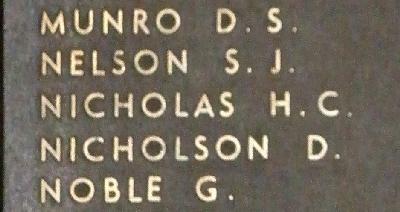 War Grave Register notes: NICHOLAS, Lce. Cpl. Henrie Clarence, 464. 3rd Australian Light Horse. 4th Aug., 1916. Age 34. Son of George Clarence and Minnie Nicholas. Native of Millbrook Ouse, Tasmania. Previous military service Served in the 26th Light Horse, Citizen Military Forces, Tasmania. Other details from Roll of Honour Circular He settled on property transferred by his father ('Meadow Bank', about 28,000 acres); Councillor of Hamilton Municipality and JP; and one of the first to volunteer. Left Australia on 21 October 1914. Served in Egypt, Gallipoli and again in Egypt. He was offered a commission in the 12th Lancers (his brother's regiment). Papers containing his discharge, delayed, came to hand just before the threatened raid on the Suez Canal. He decided to remain in his original unit until the danger was over, and he was killed in the action which immediately followed. He suffered instantaneous death by a bullet in the forehead.